This is a great ride for everyone from first-time endurance riders to world-class competitors with everything from a 12-mile trail ride to a 100-mile competition. 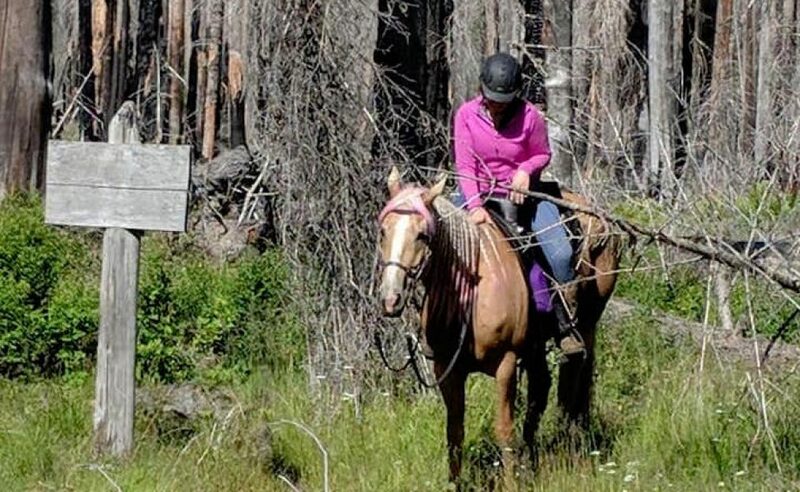 Riders enjoy miles of forested trails in the Gifford-Pinchot National Forest and adjacent timber lands. Elevation ranges from 1900-feet to 3500-feet. The well-marked trails are single track or old jeep roads. Excellent footing but shoes are always recommended for mountain rides. The ride camp is located in a large meadow near the Mt Adams Horse Camp with a stunning view of Mt. Adams from the south end of the field. Weather can be very chilly at night, come prepared with extra layers. No open camp fires (camp stoves and enclosed cooking grills allowed). There will be a communal fire ring near the vetting area. Everyone welcome. EDRA rules apply. PNER points. AERC riders welcome. Ride & Tie rules apply to R&T. USFS rules state that all manure is removed from the field after the ride. Manure removal services will again be offered by the Midnight Riders 4-H Club from Trout Lake. Simply donate to the club and they will clean up your manure for you after the ride. Or plan on packing it home with you. Certified weed free hay is required on all USFS lands. Most feed stores also carry certified weed free hay. In Trout Lake, bear right at the service station/cafe (Andy’s) and follow signs and ribbons toward the ride camp. Ride is located in the large field adjacent to the Mt. Adams Horse Camp. Camping is free in the field; however, if you choose to use the designated sites in the horse camp you must pay the nightly USFS fee. Directions from Washington: if you are coming from the north, follow the same directions as from Oregon (I.e. I-5 south to I-84). Do not come via FS23 through Randle, WA. The road is a) dirt and b) completely washed out. Google maps does not know that and it will tell you it’s the shortest route, but it’s not. Trust us, we’re local. The event is permitted by the Gifford Pinchot National Forest, Hancock Forest Management, and SDS. We are opening the trails for you! 101 days ’til Mt. Adams!